Join us for a reading group discussion of Case of Conscience by James Blish! Father Ruiz-Sanchez, a priest and scientist, is sent to Lithia, where he comes upon a race of aliens who are admirable in every way except for their total reliance on cold reason, which makes them incapable of faith or belief. 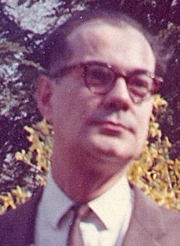 James Blish is currently considered a "single author." If one or more works are by a distinct, homonymous authors, go ahead and split the author. James Blish is composed of 8 names. You can examine and separate out names.